Megstone is a comfortable, spacious bungalow located in a quiet cul-de-sac on the edge in the coastal village of Beadnell, famed for its glorious beaches. 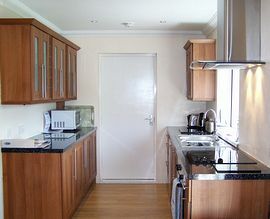 It is furnished to a very high standard, throughout. It is warm and cosy and is an ideal base for summer and winter holidays alike. The cottage is an excellent base for couples, families or small groups of walkers, golfers and water sports enthusiasts. Beadnell Bay, with its unspoilt sandy beaches, is a few minutes walk along the sea front. The very quiet North Beach is a very short walk, as is the village with its children's playground, 2 pubs both serving meals and a cafe with internet access. It is an excellent holiday base from which to explore NorthumberlandÃ­s Heritage Coastline, with all it has to offer. Entrance hall for outdoor wear. Large lounge with patio doors leading to the enclosed rear garden. 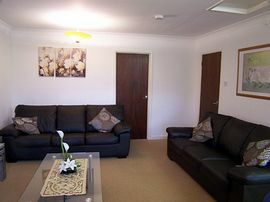 Large comfortable sofas , electric fire and electric radiator, TV, DVD, Video, freeview. Dining table seating . Electric radiator. Fitted kitchen - very well equipped with fridge with small freezer, electric cooker with ceramic hob, cooker hood, dishwasher, microwave, kettle, toaster etc. Breakfast bar and stools. Master bedroom. 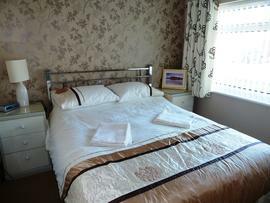 King size bedded room with fully fitted wardrobes and drawers and bedside lighting. Electric radiator. Space for cot. Bedroom 2. Full size twin beds, drawers and fitted wardrobe. Electric radiator. Family bathroom with bath and electric shower over, wash hand basin and WC shaver point and electric ladder towel rail. Garage with washing machine. Space for bikes, wet suits, golf clubs etc. ALL heating included in rent. Bed linen and towels are included in rent. Good selection of books, DVDs, games, tourist info etc. Close to the beach. Storage for wetsuits etc. Quiet location with enclosed garden for children and pets. House trained dogs (usually 2 depending on size). Enclosed lawned garden with a patio area which catches the sun all day Garden furniture provided. Local Services: Local bus service. Boat launching near by. £340.00 - £595.00 per week. Short breaks available- ask for details. Discount for couples out of main holiday periods. "We had a lovely holiday in this very comfortable cottage. It was great for getting to the beach and the pubs in the village." 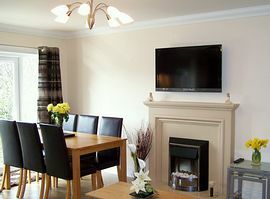 "This was our first visit to Beadnell and we loved the house and the area. Great for photography and lovely walks." 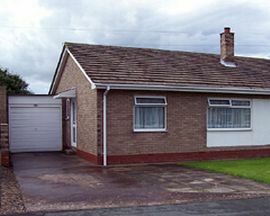 "Just booked our 6th holiday in this lovely bungalow. We love the fact that the beach is so close for the dogs and we can take our dog into the local pub"